Since 1993 when a course on Omotesenke Tea was added to the curriculum of the Nippon Club Culture Program, I have served as instructor there. 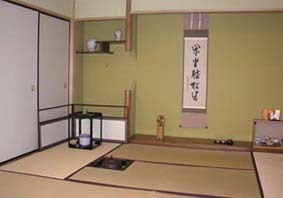 Subsequently, I built a tea room called Sohga-an just down the street from the Nippon Club to allow students greater freedom in choosing the day and time of study. Since that time, a total of nearly 500 people have been introduced to Omotesenke Chanoyu, and a number of them have continued on to become Tea Teachers themselves. In addition to Japanese students, Sohga-san also has American students. The involvement of local people gives an atmosphere to the tea room that is appropriate to cosmopolitan New York. Sohga-an actively seeks exchange with the local community and often receives requests for Tea demonstrations from a variety of sources. Helping out with these demonstrations is a wonderful opportunity for our students to develop their own skills. The New York Japanese community is extremely fluid, and thus it is inevitable that many students have to return to Japan in the middle of their studies. But to preserve the connections they have made in New York, these students have organized a "Sohga-an Graduates Club" and hold Tea Gatherings when I return to Japan. It is truly a great joy for me to see such appreciation for the unique encounters that characterizes Chanoyu. Not does Sohga-an provide a full course of study leading to all levels of certificates issued by Omotesenke Headquarters, but Masako Koike Sohga also serves as contact person for the effort to establish an US Eastern Region Branch for the Domon-kai, the organization for certificate Holders of the Omotesenke School. In preparation for its formal establishment, Headquarters Instructors have been dispatched to New York from Kyoto in 2005 for the first Eastern Region Study Session. In 2006, the Second Session was held in Florida and the Third Session will be held again in New York in 2007. These Sessions have provided an opportunity to study the traditions of tea at close range with Teachers who are in direct contact with the Head of the Omotesenke School. Whether you are a beginner or an advanced student, we look forward to hearing from you.